The Gemini TwinTM direct-port plate system is the most technically advanced single-stage plate ever designed. 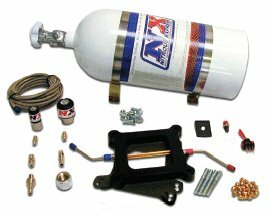 The unique direct-port pattern assures you perfect nitrous-fuel mix to each runner. It solves all distribution problems commonly found on single plane manifolds particularly small and big block Fords. Systems come complete and include lifetime guaranteed large solenoids heavy duty 60 amp anti flyback relay, Stage 6 Systems include a 10lb bottle and Pro Power Systems come complete and include lifetime guaranteed large solenoids heavy duty 60 amp anti-flyback relay, a 15lb bottle, stainless steel bottle brackets 14 foot D-6 Supply line (Race Hose). For the customer with a view to a future in street or strip applications the "Hitman Plus". The "Plus" has all the great features of the original "Hitman" but is upgradable to Stage Six capability. The "Plus" comes standard with four horsepower settings (50, 100, 150, 200) and is upgradable to 300 HP with the addition of a larger N20 solenoid and jets. If you have plans for the future, but are still on a tight budget, the "Hitman Plus" is the system for you. 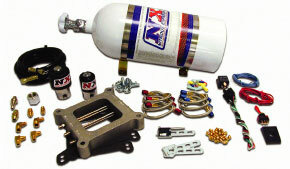 NX "Pro-Power" conventional nitrous plate systems are the most reliable and powerful on the planet. Available in gasoline or alcohol enrichment and guaranteed rear wheel power up to 500 HP, no others even come close. Race fuel is required. 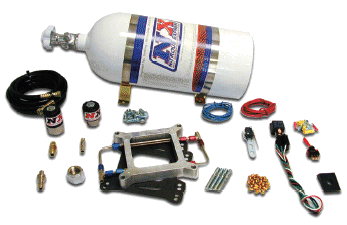 Systems come complete and include lifetime guaranteed large solenoids, heavy duty 60 amp anti-flyback relay, a 15lb bottle, stainless steel bottle brackets, 14 foot D-6 supply line (Race Hose). 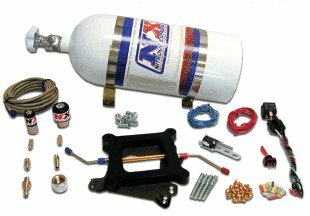 STAGE SIX nitrous systems are the absolute perfect entry level systems designed for the budget conscious sportsman racer. These systems feature the most advanced technology using the conventional spray bar design. This system includes six power settings. If your first experience using nitrous begins with a cast piston motor, our "STAGE SIX" will allow the range for serious power later when forged pistons are used. 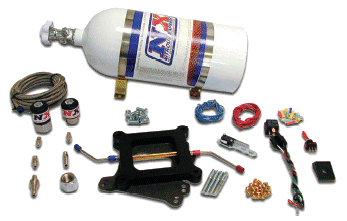 Systems come complete and include lifetime guaranteed large solenoids, heavy duty 60 amp anti-flyback relay, 10lb bottle stainless steel bottle brackets, 14 foot supply line (race hose).